I Wrote That One, Too - Colette Freedman is a top Hollywood Script Doctor who has also ghost written several novels. 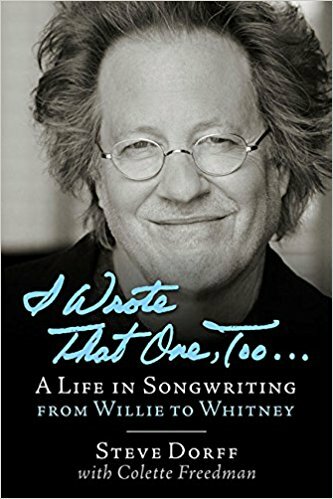 One of the most successful songwriters and composers of the last 25 years, Steve Dorff has penned over 20 Top 10 hits for pop and country artists around the world, including Barbra Streisand, Celine Dion, Blake Shelton, Smokey Robinson, Kenny Rogers, Ray Charles, Anne Murray, Whitney Houston, George Strait, Dolly Parton, Judy Collins, Cher, Dusty Springfield, Ringo Starr, and Garth Brooks. He has scored for television shows, including Growing Pains , Major Dad , Murder She Wrote , Reba , and several films, including Any Which Way but Loose for which he penned the titular song, and more recently, he has embarked on Broadway (forthcoming musical Josephine ). Chronicling his four decades behind the music, Steve Dorff gives anecdotes, advice, and insights into his journey. The book follows Steve from his childhood in Queens to Manhattan to Nashville and to his eventual arrival in Los Angeles, California. Oftentimes, songs are attributed to the singers who perform them, but it is the songwriter who really knows the story behind the story from conception to execution. Full of heartfelt stories, hard-earned wisdom, and delightful wit, I Wrote That One, Too . . . is a great read for musicians, music fans, and whoever has chased their dreams and survived the surprising but often serendipitous turns in the road.